Wait, Canonical actually listened to us? Review The final beta release of Ubuntu 14.04, due in April, is here. Code-named Trusty Tahr, 14.04 will be a Long Term Support release, meaning Canonical will support what you get in April for five years. The idea is it's a solid foundation for long-term development and planning by Canonical and users, particularly partners and businesses, using Ubuntu. It also means this is the first look that more conservative users will get at the direction Ubuntu has been pursuing since the release of 12.04 back in 2012. Ubuntu LTS releases understandably tend toward the conservative end of the spectrum when it comes to new features. You're not going to see Unity 8 in this release, nor will there be any trace of the Mir graphics stack that Canonical is hoping will - one day - support both its desktop and mobile offerings. Rather, this release sees a bunch of small, incremental improvements to Unity and the addition of some long-missing features Canonical had previously rejected. It's the latter that makes Trusty Tahr the most surprising, particularly since, in both cases, Ubuntu developers explicitly rejected the ideas when they were initially proposed. Whatever the reason for the change of heart, many users will no doubt welcome the news that Ubuntu 14.04 will include menus in windows and an option to make apps minimize when you click them in the Unity Launcher. 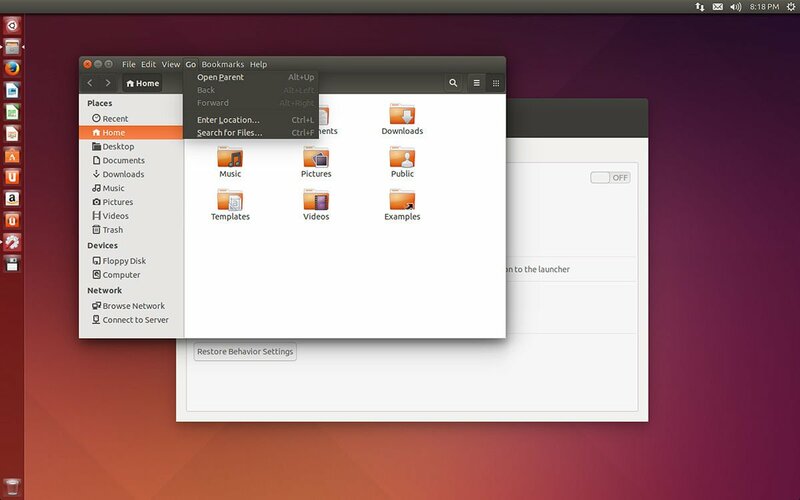 Of all the desktop paradigms Ubuntu upended with the launch of Unity, bumping menus to the top bar was perhaps the most confounding for long-time users. The justification has always been that it saved on vertical screen real estate (it's also more in line with Fitts' Law). With that in mind it should not be surprising to learn that, yes indeed, 14.04 will be adding window level menus, but, instead of adding the menu as a line of options below the window title bar the way you might expect, Ubuntu 14.04 will pack them into the title bar itself to save space. You might think this would hobble your ability to drag and re-arrange windows, but it does not. Unity is quite adept at recognizing a drag versus a click, and in my testing I never had any trouble moving windows or accessing menu items. While the menu-in-the-title-bar implementation is pretty slick, and plenty stable enough to use, the defaults remain the same - menus are up in the menu bar at the top of the screen, just as they have been since Unity arrived in 11.04. If you want menus in your title bars you'll need to head to the Appearance pane of the System Settings panel where you'll see a new option to "show the menus for a window". Just check the option "In the window's title bar" and you'll have your window-level menus back. Speaking of application menus, Canonical has also reversed course a bit and now includes the full menus for apps like the Nautilus file browser, which once again includes menu items like "File", "Edit" "View" and so on. Another surprising reversal is Ubuntu's decision to allow users to change what happens when you click items in the Unity Launcher. Unlike the typical desktop dock/panel, double-clicking an item in the Unity launcher just gives that application focus (pulling it to the front in most cases). This behavior mirrors what you'll find in Apple's OS X, but is different than what you'll find in Windows, GNOME, KDE, XFCE and most other desktops with some kind of "dock".